I just found this newpaper article about a Canadian sculptor in Yellowknife who creates museum-quality sculptures out of paper mache. SOMBA K’E/YELLOWKNIFE – Sculptor Monique Robert is marshaling a myriad of monsters in midtown Yellowknife. Her work space on Forrest Park seems more like a whimsical museum than a home studio. 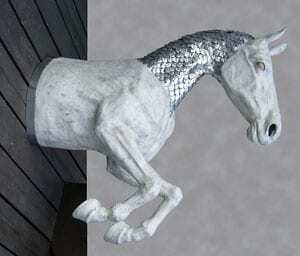 Robert fashions realistic-looking, supernatural animals loosely based on classical Greek and medieval European myths. Her retinue includes a muskox minotaur, dragons, giraffes, zebras, gargoyles and a centaur that is half-man, half-caribou. Even more fantastical is the fact that Robert creates her life-sized creatures using a specialized form of papier mache. The sculptures are rugged and strong, with the look of painted wood and the solid, smooth texture of finely-sanded fibreglass. She experimented with the medium until she got the recipe just right. “There’s nothing out there I’ve seen like it,” she said. Read the rest of the article here, then go see her online sculpture gallery at MoniqueRobert.com. She has a book that shows her sculpting process. I bought a copy, and it’s an excellent resource for anyone building large sculptures that need to be light enough to hang. Found this site through Google and thought I’d post a question. My parents had a small Asian art collection, which passed to myself when they died a few years ago. One of the items was a paper mache doll dressed in oriental garb (pretty much life-sized). Toulouse Lautrec is holding a doll that looks almost exactly like it in an 1892 photo that was published in a 1960 book on the artist’s life (see attached photo). The doll unfortunately sustained some semi-serious water damage over the years. 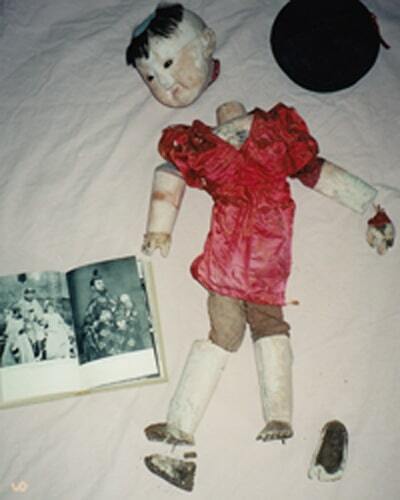 I believe this doll to be a museum piece that would need to be restored. I would like to donate the doll to an appropriate caretaker and am looking for some advice (I live in Southern CA). Please contact me at my email address ([email protected]). Hi John. I don’t know how many museum experts visit this site. Probably not many. You might have better luck calling your local university art department, and asking them for a referral to your closest expert in restoring old paper mache. Or call the restoration department of a large art museum, and see if they can help. Thanks for the tip! I updated the link. Jonni, Have you made a life size Deer before? I saw a real mounted one in a store. very expensive! The Deer was standing on he’s front feet as if he were jumping a high fence. I would love to see if you can do this. You are very talented, love looking at you artwork! Hi Jonni – thank you very much for the lovely guest post – it’s great. Also I tried to contact Monique Roberts but it didn’t go – have an e-mail address for her? I want to send her the photo of the leopard I did using her book. I’m sure she’d love to see your snow leopard, so I hope that address still works. Heh! Jonni, you and my husband would get along like gang-busters, you rule-breaker, you! That said, having been a big drawer of mythical beasts in my youth, that’s what makes them FUN! They’re not REAL! You can make them any way you like! I spent some time looking at my 11 year old cousin’s drawings of dragons and other mythicals last weekend. He got some “inspiration” from other sources, but they were definitely his own creations. I think it would be sad to lose that level of creativity altogether. There was one thing that Monique said in the newspaper article that made me smile. She said “You can do whatever you want with (mythological creatures) and there are no rules.” I found out some people think there are lots of rules – but I ignore them, of course. Back when my drawfluffy.com website was comment-enabled, I got quite a few visitors who told me (not always politely) that you must draw griffins with ears, which I left off. And werewolves don’t look anything like real wolves, as I assumed, and dragons don’t have any salamander-like parts. People can get rather rigid about how made-up animals should look. Which is sad, in my opinion. But I’ve never been good at following rules, anyway. Does she say anywhere what her magic recipe is? Stunning work, of course. Oh, duh. Yes, probably in her book. That will be one to have on the work table! Thanks for pointing this one out, Jonni. She did say in the article that she’s been typing up instructions for years, so there may be something out there, somewhere, that one could snag before the book comes out. I think I’ll just be patient. I hope she doesn’t charge as much for the book as it is probably worth, considering the quality of her sculptures. By the way, as a working artist you might have some suggestions for Vicki, the last comment on the health insurance post. We can’t, as artists, just put off a creative life just because congress can’t put together a decent health care system. Do you have any ideas for her?